Developed in collaboration with OMV, Austria’s national oil and gas company, SAVE is an interactive simulation of a refinery environment. Refinery apprentices are trained to operate equipment and plant correctly and in safety, before they are permitted to operate in the real-world refinery. 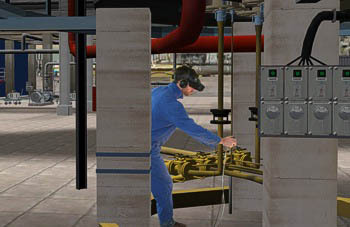 Plant and equipment are visualized via a VR headset, with the user free to explore, operate complex and large machinery, scale ladders, read gauges, etc. An experienced trainer follows his/her progress and is able to direct the training session, give guidance, and ensure that any mistakes are addressed. This type of learning is extremely motivating, especially for young Trainees. Repeating practicing can be done at one’s own pace, until the required standard is reached, without endangering the plant. This training is the most important element of safety for all new employees who have never before worked in such a plant. The educational principle of self-responsibility in learning is translated into practice: best practice! Read more about SAVE at the OMV corporate blog. Interactive refinery simulation on your desktop!